Eberspacher D3L. We aimed to minimise the intrusion of heating pipes into locker space, so as far as possible suspended them from the tops of lockers rather than the easy option of leading them along the bottoms. Straps were all made from one-inch webbing. 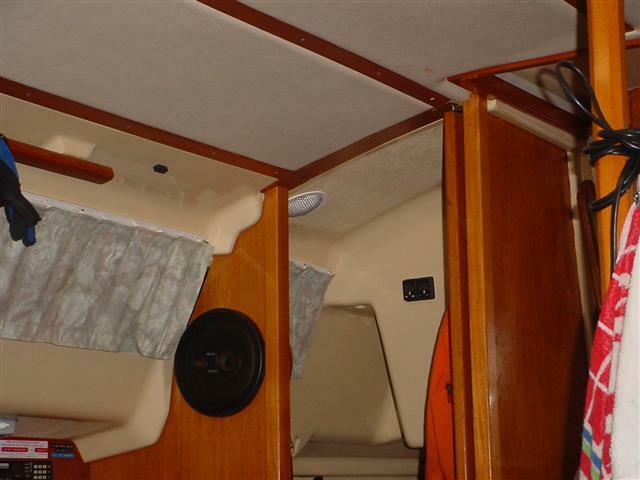 The more conventional routing for hoses in this boat is either to have a single outlet beneath the engine, blowing warm air down the centre of the saloon, or to site the unit in the port side locker, running the hoses down the port side through the galley. 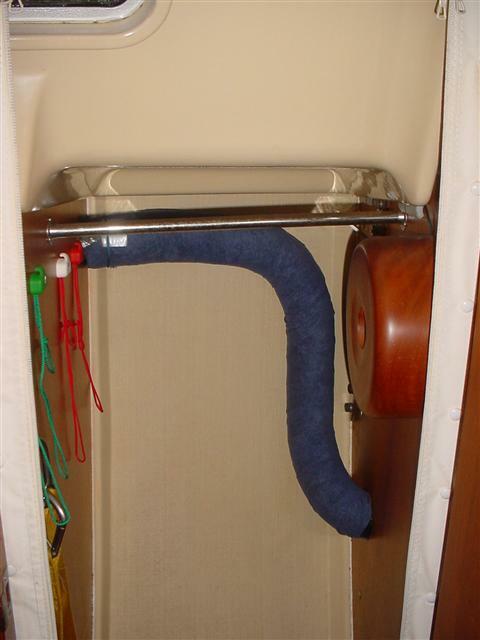 We realised that with more installation effort we could run the hoses down the staboard side and extend them right through to the forecabin with little impact on locker space. The Eberspacher unit located in the stern locker, starboard side. The insulated hose is the warm air discharge from the unit, cool air being drawn from the aft end of the aft cabin. 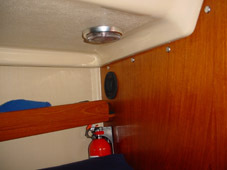 Combustion air is drawn from the stern locker while exhaust goes to the transom. The fuel supply is taken from downstream of the primary fuel filter via the T-piece shown. This is contrary to the advice of Eberspacher, although this is intended specifically for trucks. The far higher rate of fuel flow in a truck can starve the heating unit, or even draw air into the supply to the engine. Our layout has been like this for over ten years without problems. I have received the following from Mr Peter Collard, Technical Engineering Manager of Eberspacher UK. 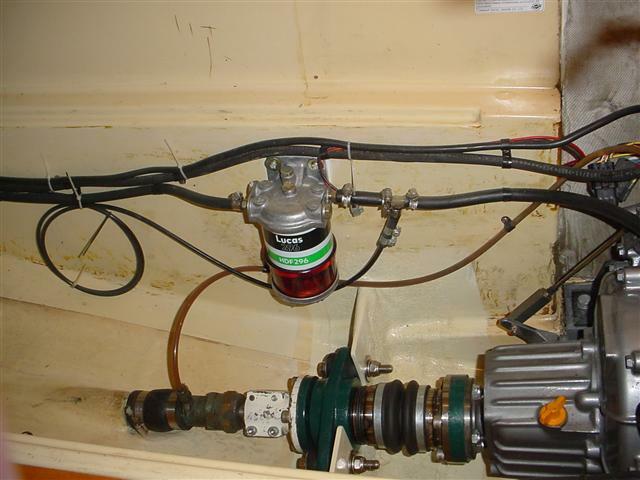 B, if a fuel line is not under positive pressure, as most boats are not these days, it affects the fuelling of the heater because the pump is not designed to pull up a large bore engine fuel line or stand pipe. C, If there is a minor fuel leak on the engine system at any point, or the pump, injector etc. is not sealing, the heater, if run without the engine, can pull air into the engine fuel line. D, plastic parts are not permitted in the fuel system these days again by both RCD and if you are in an estuary Boat Safety Scheme also applies. 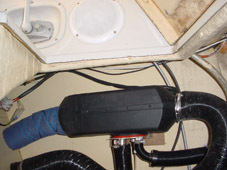 The insulated ducting carries warm air forward from the unit. 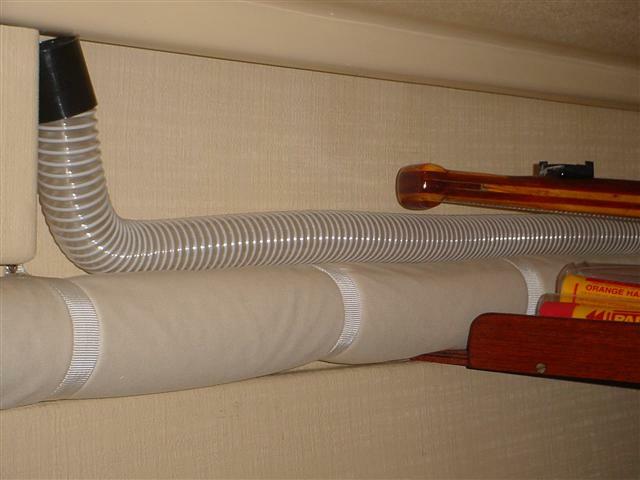 The spiral wound hose is part of the hair-dryer attachment that came with our unit. From the aft cabin the ducting drops down inside the hanging locker, then goes forward alongside the chart table. Here there is a T, from which the main flow runs towards the centreline of the boat, emerging beneath the chart table. The other, smaller-bore branch runs along the top of the lower side lockers in the saloon. At the forward end of these lockers there is a bulkhead and a ring frame that we did not want to drill, hence the diversion shown. 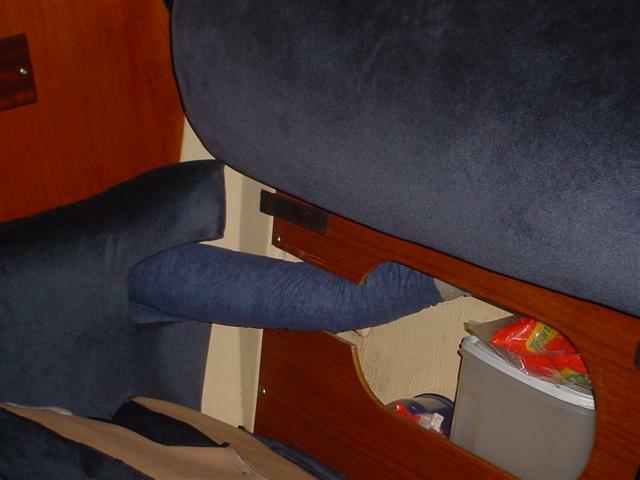 The side of the locker was cut away and the forward cushion required some modification. 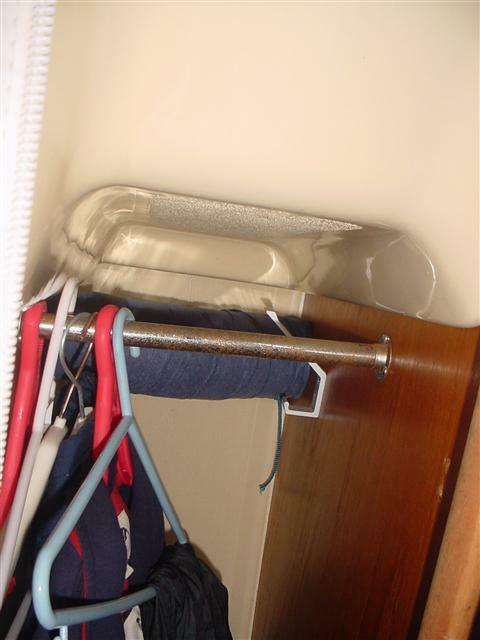 From the saloon the ducting emerges into the wet locker, where it rises upwards in order to minimise space loss in the hanging locker and to arrive at the correct height in the forecabin. Heating outlet in the forecabin. Heating controls in the aft cabin and above the chart table. Running the cables for these controls was very time-consuming, as is all additional wiring on a Sadler 34. The thermostat with 7-day timer is located on the bulkhead that is the forward end of the cockpit. The temperature sensor is the small black rectangle above the curtain, aft of the hand rail.